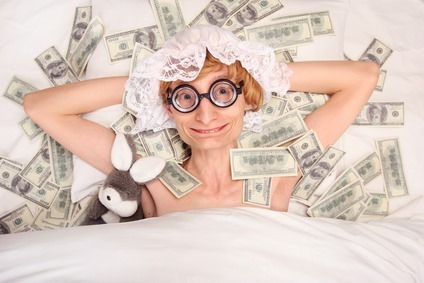 Let’s face it – money ruins marriages, causes huge amount of stress and this doesn’t stop when we sleep. We don’t worry all day and then sleep about being the king of a castle! No, it grabs us and consumes us day and night so if we want to dream about it raining money we need to change our daily activities. 1. Maintain your super account and make sure it is working for you. Consolidate all of your super accounts into one. 2. Make sure you are taking advantage of money savings on your bank accounts and super accounts. 3. Even if it is only $5 or $10 save this every pay and pay yourself. 4. Make sure the whole family contributes to money saving ways. Take lunches to school work everyday, except Friday for example. And the family could have a garage sale. 5. There are many rewards and shop-a-dockets out there – but use these wisely. 6. Take drinks when you go out with the family and do some home baking and cut down on packaged foods. 7. Don’t pretend to others that you have money and go in further debt. There are more people with money worries than you can imagine! 8. Find things around the house that need to go – sell or give away. Being generous to others will help when you are feeling money deprived. 9. Limit your coffee purchases. 10. Have at home movie nights. The secret to money is being organised and knowing what your money is doing for you and then it is easy to see if one area is failing you – then be brutal and change it. There are so many ways to make a difference, but we often don’t see these when we are just seeing money worries.